The UNESCO Chair in ICT4D is a group of researchers and practitioners committed to excellence in the use of ICTs for development. It was created in 2007 through an agreement between UNESCO and Royal Holloway, University of London, and builds on the earlier work of the ICT4D Collective created in 2004. It is one of only 15 UNESCO Chairs in the UK, and the founding Chairholder is Tim Unwin. Between 2009 and 2016, much of the work of the Chair coincided with that of the multidisciplinary Research Centre on ICT4D at Royal Holloway, University of London (led by Dorothea Kleine between 2011 and 2016). 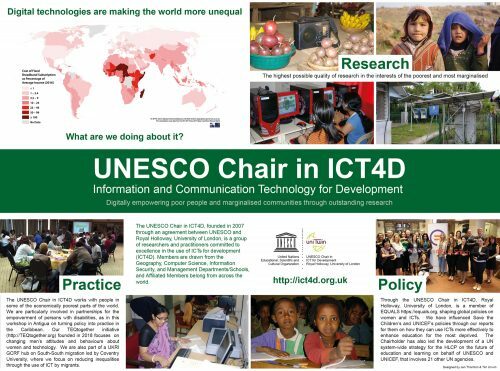 Currently members of the UNESCO Chair in ICT4D are drawn from the Schools and Departments of Computer Science, Geography, Information Security, Law and Management at Royal Holloway, University of London, with affiliated members also belonging to the Chair from across the world. Annual Reports from the Chair are available here. The Chair’s primary focus has been on the highest quality multi-disciplinary research, and particularly on developing the skills and expertise of postgraduates at doctoral and Master’s level. The group also uses its research to influence high level policy through its membership of, and partnerships with, international organisations, the UK government, companies and civil society organisations. Members of the Chair are committed to collegiality, openness, transparency and collectivity in the interests of the poorest and most marginalised, and we welcome all those who share these principles. We strongly believe in the importance of multi-disciplinarity for high quality research and teaching in ICT4D, and enjoy teaching in each other’s departments as well as joint supervision of research students across departments. The Chair created the ICT4D group on Facebook in 2007, which is the largest social media group concerned with ICT4D and had more than 5,180 members in April 2018. In 2012, the group was named 10th top Global Think Tank in Science and Technology in the University of Pennsylvania’s influential Go To Think Tanks Index Report and has remained in the top 10 ever since, being 7th in the 2015 Index and 10th in the 2016 Index.